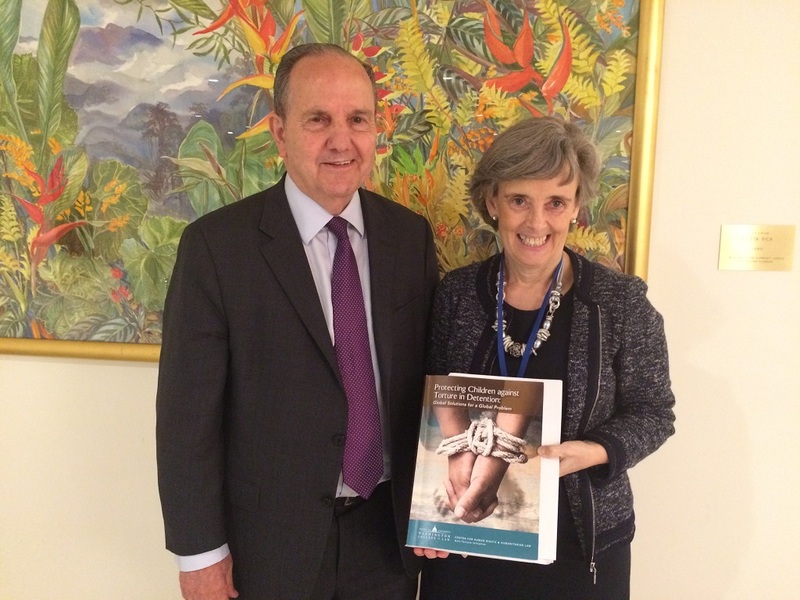 New York, 22 May 2017 - SRSG Santos Pais joined the Washington College of Law, the Permanent Mission of Switzerland, Disability Rights International and Human Rights Watch in hosting the UN launch of the new publication Protecting Children against Torture in Detention: Global Solutions for a Global Problem. With contributions by more than thirty international children’s rights experts, the book seeks to strengthen the protection of children deprived of liberty from torture and other forms of violence. The articles in the volume provide valuable reflections into the intersection between children’s rights and the international prohibition of torture, ill-treatment and other forms of violence against children. The publication addresses a variety of contexts, including children deprived of liberty in the criminal justice system, in the context of armed conflict, in orphanages and other care institutions, and in the context of migration and asylum seeking. SRSG Santos Pais commended the sound evidence provided by this new report and the opportunity it offers to mobilize wide support for the implementation of international human rights standards and of the 2030 Agenda for Sustainable Development, both to prevent children’s detention and bring an end to associated risks of violence. ”Despite the strong normative foundation agreed upon by the international community, children’s right to freedom from violence remains seriously compromised by a persisting governance gap between standards and practice”, she stressed. “This important report reveals the urgent need for a paradigm shift. The Global Study on Children Deprived of Liberty called for by the United Nations General Assembly, to which this book is a valuable contribution, will help to bring decisive attention to this much neglected area. With the Global Study, we can reach out to children who have been left furthest behind and the safeguard of their rights can become a genuine indicator of progress for all nations.” stressed Ms. Santos Pais. The diverse perspectives offered by the authors, paired with the former Special Rapporteur’s report, provide innovative solutions to an all-too-common reality faced by children deprived of liberty around the world, and illustrate a profound commitment to the ongoing challenge of protecting the fundamental human rights of children everywhere.